Garlic Butter Parmesan Carrots are roasted to absolute tender perfection in the most amazing garlic butter parmesan coating! These are the best carrots I have ever had! I have been dreaming about these carrots since I had them. They are hands down the BEST carrots I have ever eaten. 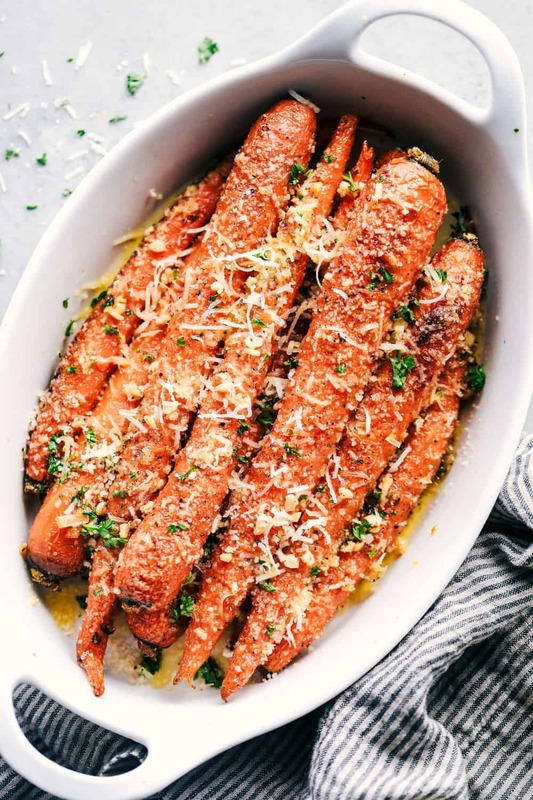 I thought that these Roasted Brown Butter Honey Garlic Carrots were my favorite…. nope. Because Garlic Butter Parmesan is my love language. These carrots couldn’t be easier to make. I used whole carrots for this recipe but you can also use baby carrots or slice the carrots up to your preference. 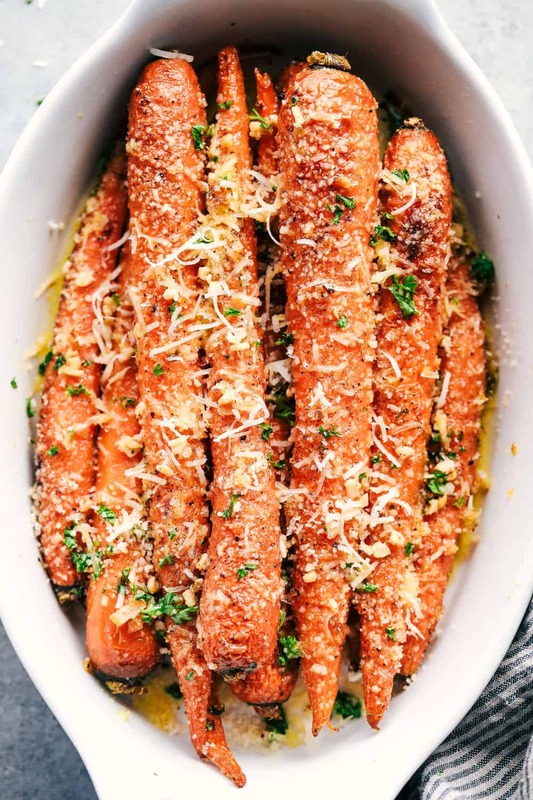 You toss the carrots in a garlic butter with parmesan inside and roast them in the oven for 15-10 minutes. I promise you that these will be the star of the dinner table! You start by buying your carrots of choice. Baby carrots or whole carrots will work great. You lay the carrots on a baking sheet and salt and pepper them. You add melted butter, olive oil, garlic, and parmesan to a small bowl and mix, then pour on top and toss until coated. How long does it take to roast carrots at 425? If you have large carrots it usually takes 20-25 minutes stirring once in between until brown and tender. Once they come out of the oven, garnish with fresh parmesan and chopped parsley and enjoy! These are going to be a hit at the dinner table! Preheat oven to 425 degrees. 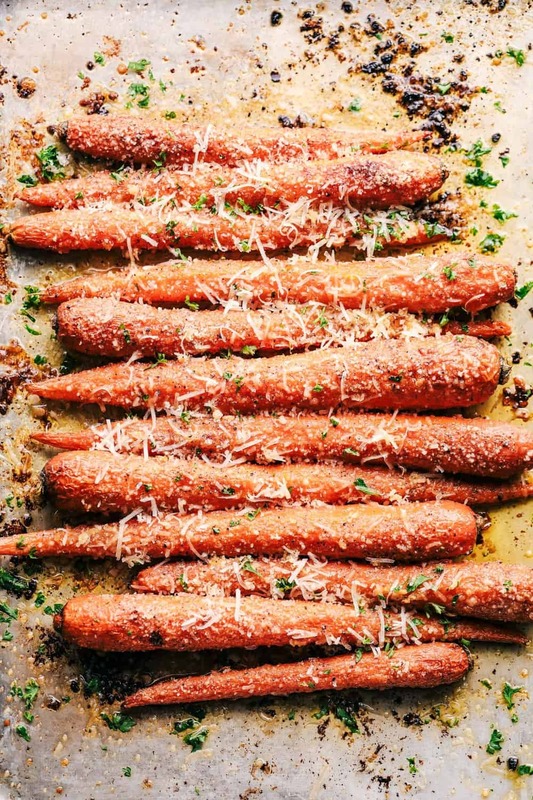 On a sheet pan, line your carrots in a single layer. In a small bowl add melted butter, olive oil, garlic, and parmesan. Pour on top of carrots and toss to coat. Roast for 20-25 minutes or until carrots are brown and tender. Serve with freshly grated parmesan cheese and chopped parsley for garnish. I first made these carrots from the recipe on Yourhomebasedmom.com. They are tasty. Do you peel the carrots first?